If you’re interested in a Taurus woman, tell her. Don’t play hard to get or any other frivolous mind games. As an earth sign she is practical and responsible, and she is looking for the same things in a partner. And if you offer tokens of affection, that’s even better. Get free dating tips on how to woo a Taurus lady. To catch the attention of a Taurus female in the first few dates, the best thing to do is appeal to her intellect. Astrologically, she is smart and a great conversationalist, and anyone who can keep up with her sharp mind will earn a check in the plus column. But make sure the talk is not all about you, or even all about her. Discuss local issues or world events and show her you’re not afraid to speak your mind (for she certainly isn’t). She values honesty above all else because with her, what you see is what you get. She’s not looking for playboys or a quick fling, she wants the real deal. Court her in conventional ways with flowers and romantic dinners. Although the woman of this zodiac sign is a pragmatist she also loves beautiful things, so buying her lavish gifts to show your affection is a good start to the relationship. But don’t worry about trying to keep the Taurus woman interested, for if she likes you then she likes your personality as is. She’s not concerned with the fast pace of the world or other people. She takes her time to get it done right, and that’s all she expects of you. Otherwise be ready for a breakup! But if you don’t have a job or at least financial security then you won’t even make it to the next stage. Security is high on her list of priorities and she wants a love partner who can take care of his own. She needs to feel you can support her in times of crisis, and if she’s looking to start a family then she wants you to be able to provide for them too. 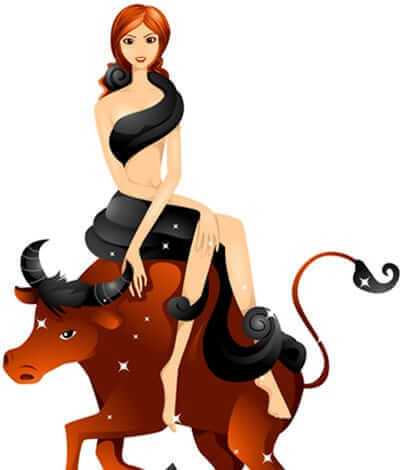 Taurus women look for a strong male figure who knows what he wants and knows how to obtain it. Now that isn’t to say she can’t take care of herself, for she’s more than capable of handling her affairs. She simply needs a companion who can do the same so she doesn’t have to worry about taking care of him too. Love compatibility in terms of mental and emotional stability is a must for this lady! Once you’ve shown her, to her satisfaction, that you are stable and ready for commitment, the Taurus female will take your hand and lead you into the bedroom. And this is where she really shines, for she enjoys exquisite physical pleasures too. Soft caresses, gentle kisses, and the whisper of loving words will get her in the mood, and after building up the sexual intimacy she will finish off the night with a satisfying climax. Make sure to hold her afterwards and profess your love for her, so she will be reassured that this meant as much to you as it did to her. Again, she’s looking for the love of her life in he relationships. So if you want to become a part of that life, make sure you are ready to build a sturdy, comfortable household with her. The Taurus female cherishes her home and takes good care of it, as she does with everything else, so be sure to respect her space. She will let you take charge if you want, just don’t try her patience – you will get the bull by the horns if you do! But tell her you want to be in her life forever, and she will keep you there. Next Are Arguments Good For Your Relationship? I’m A Taurus Woman! once I am done I am done no turning back! i’d a taurus ex 2 years ago. i am libra and i broke up because of certain differences and i asked her to get back after about 6 months and she denied and another 6 months later got with an aries and blocked me from all social networks and contacts. i never moved on though. now that so much time has passed, i wonder if she ever thinks about me or will she respond if i try to contact her. i still love her and want to initiate the conversation but im not sure if i should. will she come back to her ex (me) if i try? I don’t think so. Once a Taurus woman gets over someone, it’s over. Even if she comes back to you, she’ll never think of you the same way and she’ll never be able to love you as fully as she once did. This is very ture a Taurus is a very loyal person and we Love hard once someone treats us very poorly/ abuse us we will for give but it will never be the same.